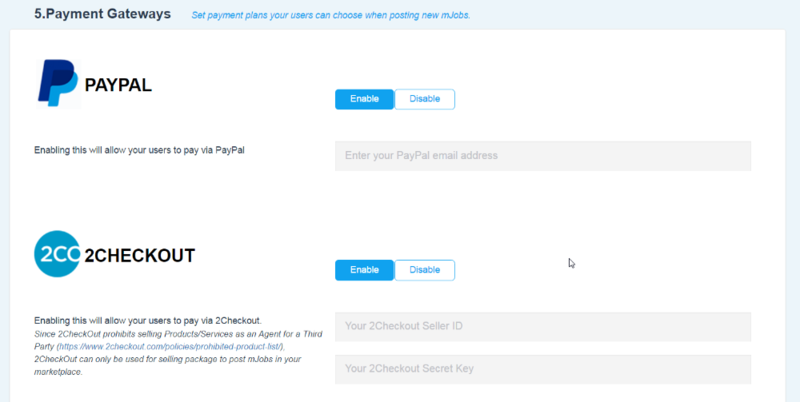 Payment plans are price packages you create for your users to choose when posting mJobs. 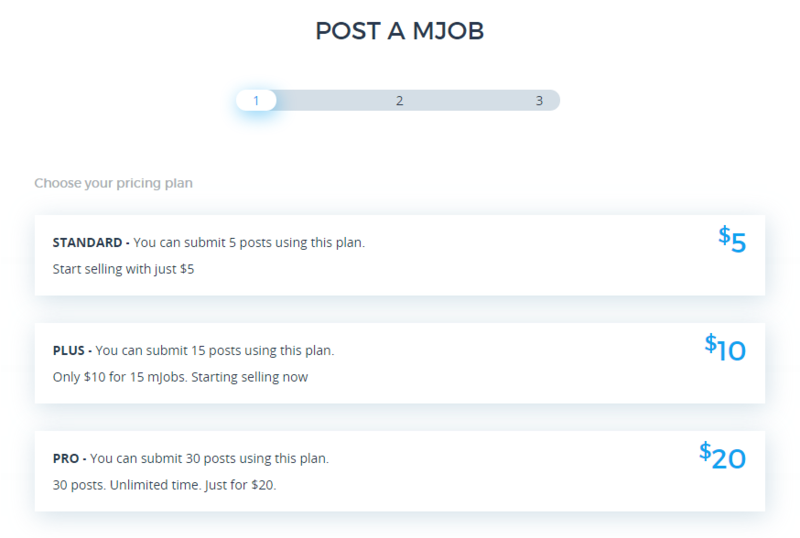 Each payment plan shows package name, price, period (in days) a mJob will be activated on your site and the number of mJobs that can be posted with the package. Where? Engine Settings → Theme Options → Payment Type. 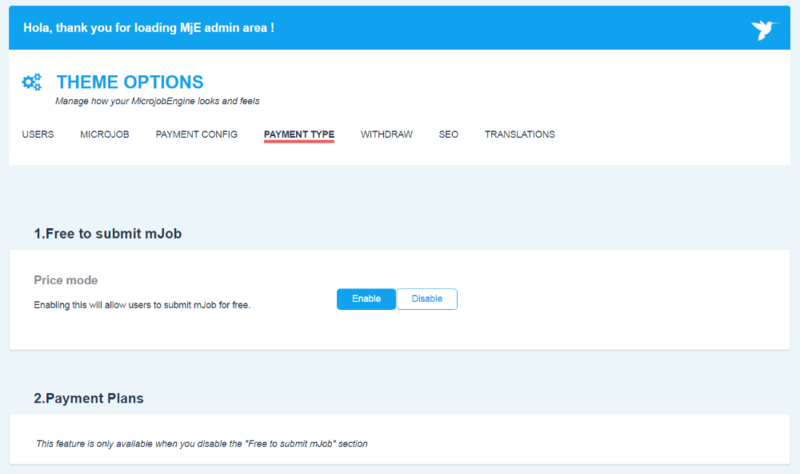 Enable the “Price mode” field under the “Free to submit mJob” section. - Duration: the time (in days) a mJob is active on site. It can be permanent. - Number of mJobs that can be posted using this package. - Short description about this package. Then click " Save plan" to complete. You can also edit payment plans by clicking the Pencil icon next to it. After that, you can enable Payment test mode to check your payment plans without having your account charged. Where? Engine Settings > Theme Options > Microjob > mJob Price. How? There are 2 options allowing you to set either custom price or fixed price in the price mode. When you enable the custom option, sellers can set specific price for each of their mJobs. Besides, you have to set the minimum and maximum prices applied for mJob in the custom price section. Minimum price must be greater than 0. There’s no limit to the maximum price, but it must be greater than minimum price. Both minimum & maximum price must be an integer. If you choose fixed price as your settings, you only need to set a default price applied for all mJobs on your site. This means the seller cannot customize their mJob price. 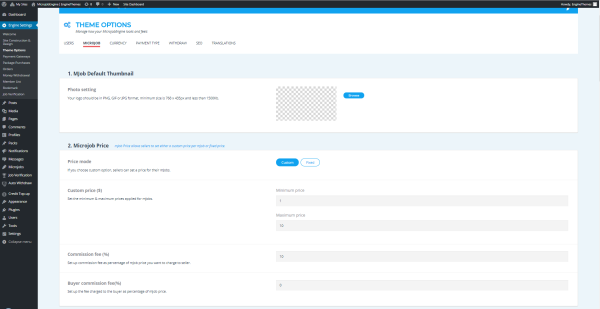 How it look on the front-end when you choose custom pricing option? After choosing a package plan, a user would fill in details of the mJob. In this step, you need to create mJob categories for users to choose from. Where? Microjobs → Microjob Category. 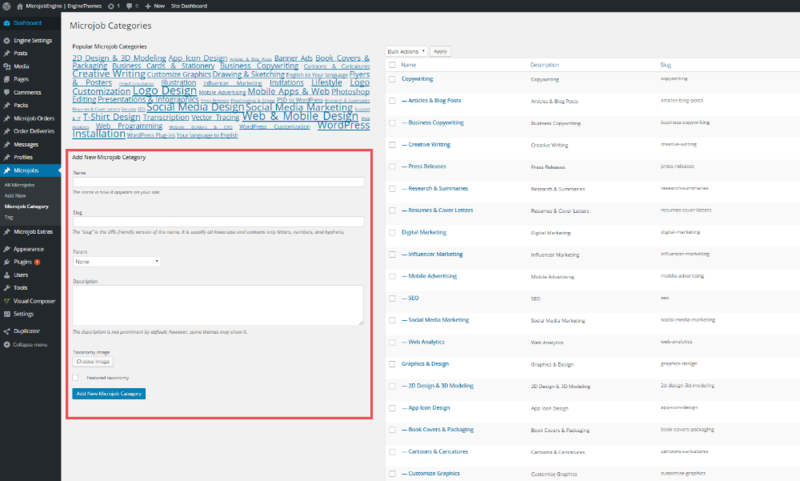 This section allows admins to add and control all the mJob categories. How? In the left column, fill in necessary information to create a mJob category, including name, slug, parent (if it is a sub category), description, image. You can then edit or delete mJob categories in the right column. There are 3 main settings: Payment currency, Commission fee, and Payment gateways. 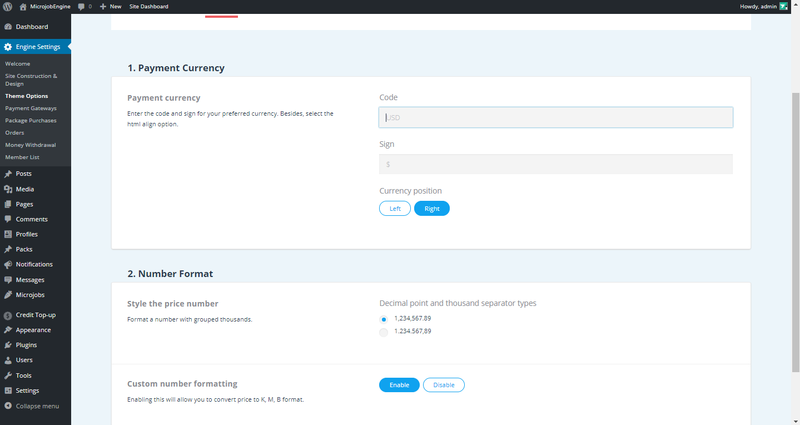 Wherever you are, it is easier than ever to set your very own local currency with flexible choices for number format (decimal point or thousand separator). You can also format the displayed number. On the other hand, commission fee is an effective way of monetization. In MicrojobEngine, this fee is calculated as the percentage (%) of the mJob price. For instance, if you fill in number 10 in this section, your commission fee over 1 posted mJob is 10% of total price of that mJob. There are 4 supported payment gateways: PayPal, 2Checkout, Cash, and Credit. You can use all of them, or disable some. - Since 2CheckOut prohibits selling Products/Services as an Agent for a Third Party ( https://www.2checkout.com/policies/prohibited-product-list/), 2CheckOut can only be used for selling package to post mJobs in your marketplace and is not available when users order mJobs. - Since PayPal doesn’t allow orders with the same invoice number, a new field is available for you to add the prefix to avoid the case of invoice number duplication. Remember that you MUST enter a unique prefix if your PayPal account is used for multiple websites. How? 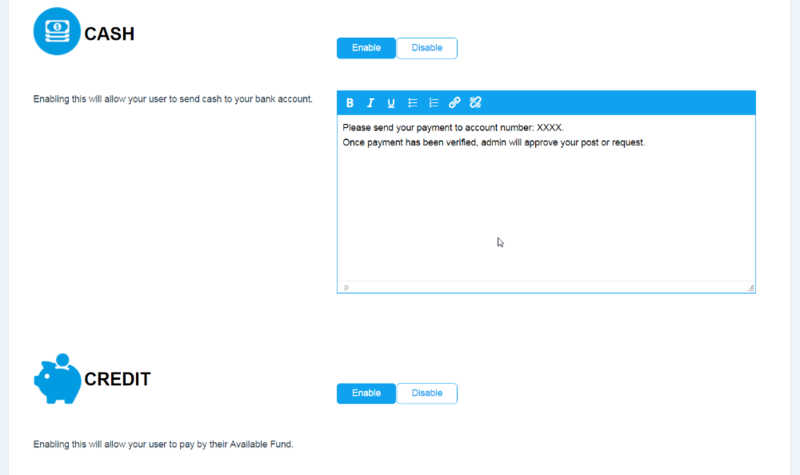 When users withdraw money from your site, you can set the minimum amount required for each withdrawal.